UNL Extension is celebrating its first 100 years by "Always looking forward" at this year's Husker Harvest Days show. The show is Sept. 9-11 near Grand Island. "We're proud of where we've been and what we have helped this great state and university accomplish, but we're even more proud of what's ahead of us," said dean and director of UNL Extension Chuck Hibberd. 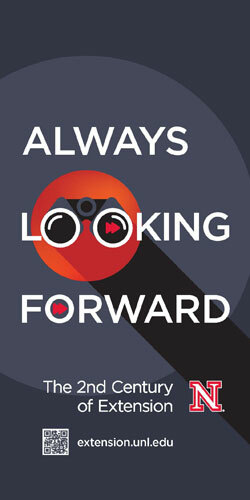 As UNL Extension celebrates its first 100 years and looks to the future, "Always looking forward" will form the theme for this year's Institute of Agriculture and Natural Resources exhibits at Husker Harvest Days. These exhibits continue UNL's commitment to annually changing themes at Husker Harvest Days that are keyed toward bringing the public the latest and most relevant IANR research and extension programming. "This year's exhibits focus on extension, research and outreach initiatives that will further position the University of Nebraska, our state's leading agricultural economy, and all of our citizens for continued success and prosperity in the coming decades leading to 2050," said Ronnie Green, NU Vice President and IANR Harlan Vice Chancellor. "We're very proud of where we've been, but we're even more proud of being in an internationally leading position to meet the challenges and opportunities ahead of us," he said. Using sensors deployed at various levels, from the ground to the sky, to more effectively manage water and nitrogen use on crops. The latest in agricultural use of drones, or UAVs, will form an important part of this exhibit. The critical importance of pollinators, such as bees, to the food system and their helping to manage production, as well as their role in protecting and furthering natural environments to ensure their continued sustainability. Innovative digital diagnostic technology that allows homeowners and agricultural producers to draw upon a network of experts to identify plants and insects. Developing management tools to better understand climate variability and its potential impacts on successful decision-making in agriculture. Strategies for utilizing alternative forage sources such as crop residue in Nebraska's thriving beef industry. Nebraska's leading role in a regional initiative to develop protocols and strategies designed to mitigate the Shiga-toxin producing E.coli bacteria. Assessing and developing Nebraska's broadband capability and its importance to economic development and vitality across the state. Agricultural literacy, career awareness and career development programs designed to help Nebraska youth better understand where their food comes from and how they can prepare for a career in the rapidly expanding agriculture and natural resources fields. UNL faculty and staff at a central information booth will be ready to provide assistance in answering questions on a variety of extension and research-related topics, provide copies of helpful NebGuides, and direct those needing further help to extension experts in their local area. The red Husker building is also the place to learn about the latest opportunities for students at UNL's College of Agricultural Sciences and Natural Resources, and the Nebraska College of Technical Agriculture at Curtis. College representatives will be available throughout the show to answer questions from potential students. Those interested in the Nebraska LEAD (Leadership Education Action Development) program can also visit with a LEAD representative. IANR's Market Journal team will be at the show, as well, along with information and activities on natural resources and agriculture-related careers. 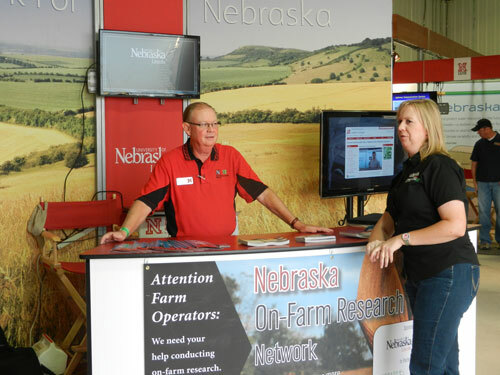 This is the seventh year IANR's teaching, research and extension exhibits focus on a specific area of importance that is relevant to all Nebraskans and visitors to the red Husker exhibit building on the south side of the showground at Lot 321. There, and in the large white tent next-door, show goers will see many of the ways IANR and UNL Extension are working at "Always looking forward." "Each year, this show becomes a premier venue for us to bring the campus to Husker Harvest Days and seeing all the people that stop in to see us each year," Green said. "People stop to see what's new, ask us questions and share what they see as Nebraska's main challenges and opportunities. We are the people's land-grant university."